I have failed more than I have succeed and cried oceans of tears over fallen dreams and failed relationships but through it all I have realised how much more rewarding it is to go down fighting. I love running for my country. It’s hard to beat putting on the ‘green and gold’ and hearing your name announced in a stadium full to the brim of screaming supporters. Let alone if you are victorious at an international event and our Aussie anthem booms through the stadium as you are presented with your gold medal. I got to hear that beautiful song played nine times in my career. 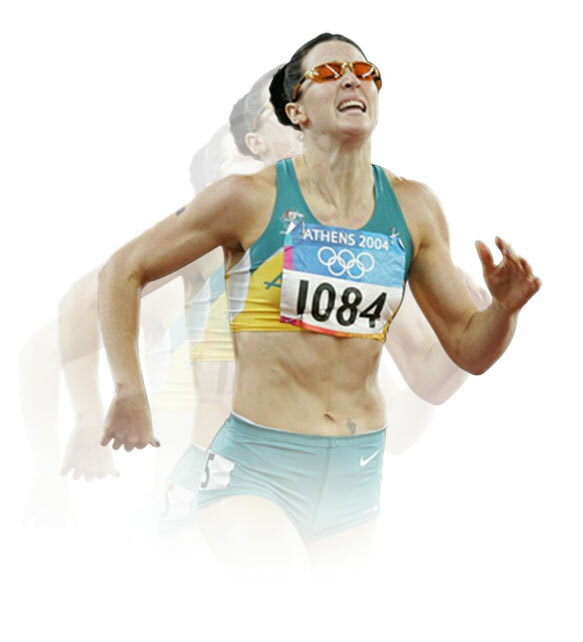 My heart is full of fabulous memories from racing in my first Olympic games in Sydney 2000 as a 17 year old, to havingCathy Freeman pass me the baton in the 4x400m relay at the Commonwealth Games in Manchester or winning my second World title only 8mths after the birth of my son. Over the years I have been very lucky to get ridiculously close to achieving many of the goals I dreamt of as a child. But after winning the two senior world titles and four commonwealth championship gold medals in athletics, I still chased that elusive Olympic gold medal. It had filled my very waking moment from the day I fell in love with the sport of athletics at age nine. As the years past and injuries sidelined me time and time again I had to come to terms with the fact that not every goal will come to fruition. Just as I thought the Olympic torch was out for me, the call came to join the ‘Aussie’ women’s bobsled team. Jumping in alongside my old track training parnter Astrid Loch-Wilkinson we took on the slippery death defying slopes, she as my pilot and I her brakeman. This amazing opportunity to reinvent myself athletically, climaxed in my third Olympic games in Sochi 2014. It may have not been a gold medal performance but the chance to be the first Aussie women to compete in both summer and Winter Olympic games is the highlight of my career. Whilst sport was my identity, my true passion lies elsewhere. I am now incredibly lucky to share my life with three little Gold medals, with my gorgeous children Cornelis, Emily and Jemima. Nothing can describe the joy I feel with every little smile and kiss they gift me with. After Cornelis was born, there was a time I thought I wouldn’t be able to have more babies as I lost a few little angels to heaven and had a scare with abnormal cells in my cervix. These challenges reignited my childhood fire to become a doctor with the future hope of working with women and pregnancy as an obstetrician/gynaecologist. Now in my 4th year of medical school I am rapidly chasing that dream. I already have the privilege of being ambassador to a few amazing organisations in the medical world like ‘Australian Cervical Cancer Foundation’, ‘Save the Box (RANZGOG)’ and ‘Targeting Cancer’. These days I secretly believe that all my work in sport might simply have been to give me a voice for things like cancer awareness and research. Life has been a bundle of challenges and an exhilarating roller coaster but I wouldn’t have it any other way. I have been to the top of my tree in sport and now I am on the bottom rung of another career. I share my journey warts and all in my autobiography ‘Just another Hurdle’. I have no idea what the future holds, the next goal might beat me too, but I will just get back up again and keep on fighting. I am excited to think of the possibilities and will continue to build my furnace boldly and whole-heartedly. I pray you do the same.